We are honored to serve many active duty military members while they serve our country. As the exclusive lower limb prosthetic contractor to Walter Reed National Military Medical Center and the only prosthetic company in the nation directly contracted by the Department of Defense, we have unmatched experience treating the unique needs of active duty military. 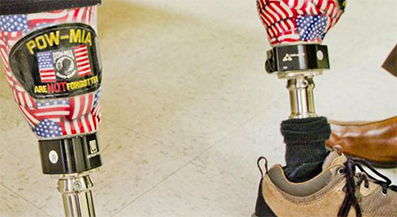 If you were injured in Operation Iraqi Freedom and Operation Enduring Freedom, we are here to make sure that you have the prosthetic support that you need and deserve. As battlefield technologies, field medicine, and the arenas of battle have changed over the years, more veterans are facing multiple limb loss and other complex issues that require the unique understanding and experience of the team at Medical Center Prosthetics. We are innovating on a daily basis at Walter Reed National Military Medical Center and at our amputee care facilities in the Washington, DC and Boston, MA areas to bring the best solutions in the world to members of our nation’s military. If you are a veteran, we would be honored to put our experience to work for you to optimize your prosthetic outcomes. Medical Center Prosthetics proudly accepts Tricare.